For most clubs in your bag, hitting down on the ball is key. You work to make contact just before the bottom of your swing, compressing the ball against the turf and sending it toward the target with plenty of force and a slight backspin. But for the big stick, that all changes. For great driver power you want to contact the ball on the upswing, just after your swing has bottomed out. For this drill we use a ramp — almost like an old Evel Knievel jump (Photo 1). It shows that you’d like to have the club working up the ramp rather than down the ramp. Everyone wants to hit it farther, and there’s a huge correlation between how far the ball goes and angle of attack, or descent. In Trackman, we try to get the positive angle, which means the club is traveling upward at impact (Photo 2), instead of downward (Photo 3). The ramp helps you see that you need to get the right shoulder lower than the left, with the ball played close to the forward foot, putting the majority of your body behind it. The key here is the spine tilt to the right (Photo 4). I’ll see a lot of people set up with the spine tilted the wrong direction (Photo 5). 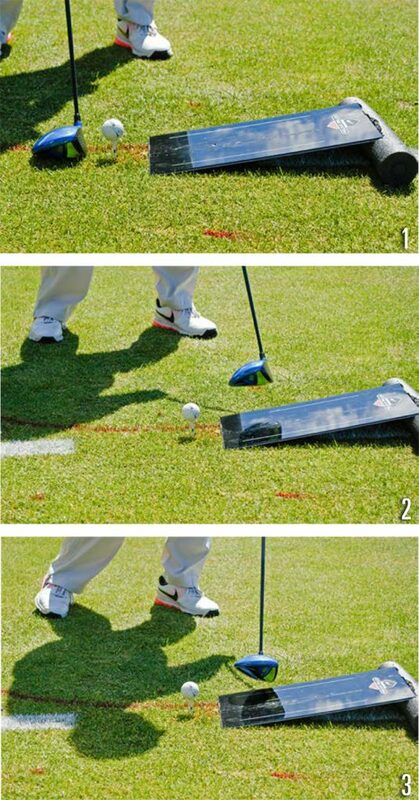 So once you get set up the proper way and hit a few golf balls, you’ll start hitting it with an upward strike. The idea is to miss the ramp. You start at slower speed until you get comfortable with the ramp. 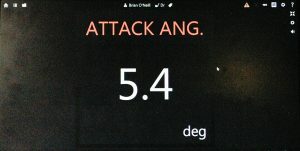 We track your attack angle. The shoulder tilt and a wider stance helps shallow out the takeaway and forward swing, which also leads to a better attack angle (Photo 6). It’s also easier to get the club face square to the target with the club head is traveling up. That leads to less backspin, so the ball stays in the air longer and doesn’t climb. You want a high launch angle with low spin. Master that without doing anything else to your swing, develop that feel of hitting upward, and you could see 20 to 25 yards of distance gain on your driver, without swinging hard. Back in our indoor facility, let’s go to the numbers from my on-range Trackman. The positive number shown below means the driver is traveling upward. Nearly 90 percent of golfers hit down on the ball with the driver. They think they’re hitting up on it, but they’re not — and that affects where the ball hits on the face, and with the bulge and roll of the driver face, and a heel hit, it’s going to slice a lot more.